W. T. Grant or Grants was a chain of United States-based mass-merchandise stores founded by William Thomas Grant. The stores were generally of the dime store format located in downtowns. In 1906 the first “W. T. Grant Co. 25 Cent Store” opened in Lynn, Massachusetts. Modest profit, coupled with a fast turnover of inventory, caused the stores to grow to almost $100 million a year in sales by 1936, the same year that William Thomas Grant started the W. T. Grant Foundation. 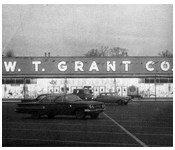 By the time Mr. Grant died in 1972, at age 96, his nationwide empire of W. T. Grant Stores had grown to almost 1,200.